This trip started early, and BY GOD! Do I mean early, 3:30 (in the) am Friday 3rd February. I mean come on I thought it was an urban myth horror story that there was a 3:30 in the a.m.! So I drive to my brothers home, he drives us to collect Robert and John from their homes, then onto Newport where we are meeting the final member of our little troupe Phil. At this point I should give a shout out to the one of our number not with us, Kevin who unfortunately wasn’t well so couldn’t make the trip. Get well soon and look forward to travelling with you next year mate. 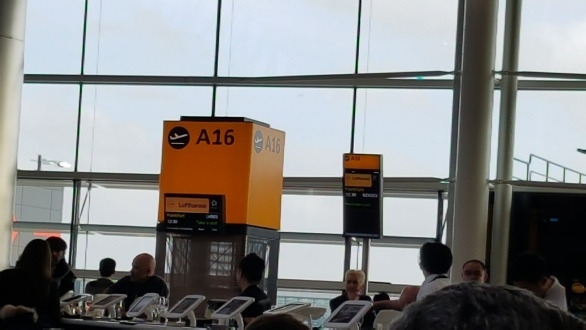 So we arrive at Heathrow, and our journey almost ends there as there is a faint but rapidly growing scream of “look out”… “excuse me” …. “EXCUSE ME… LOOK OUT” and a young blonde blur bowls between us and disappears up the escalator. 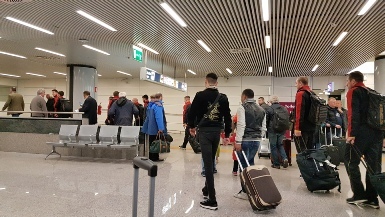 As we’re “carry on” only there’s no luggage check in, we go through security and it’s straight to a bar … well it is a group of guys on Rugby Tour. 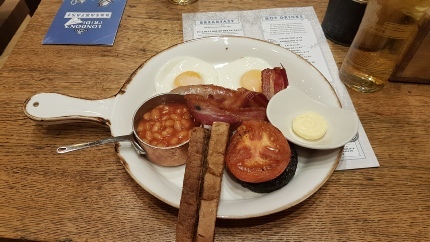 Deciding discretion is the better part of valour we resolve to combine the lager with a meal, and although it feels like I’ve been up for hours … nay days, it’s still breakfast time, so 5 breakfasts it is, at the London Pride Fullers Pub at Terminal 2. 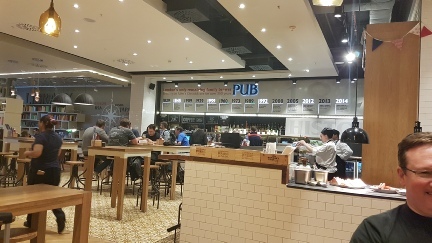 Now this is the first “Air side” venture of a well known London Pub chain, the food is nice the beer cold and refreshing, the lady serving and advising us very friendly and helpful and to be honest the ambiance couldn’t be faulted for what is, really a generic pub eatery. The only slight surprise coming with the bill, when 5 pints and 5 breakfasts set us back £84!!! 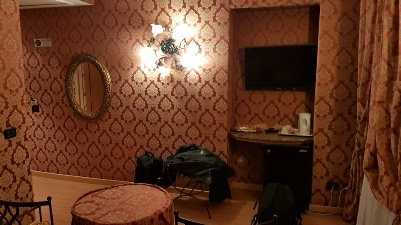 This photo being a zoom of the one immediately above it! Onto the flight, take off within 5 minutes of advertised time, we make up some time so land a little early, back through security, never quite understood this, why we can’t always be kept air side, as we were at one airport on the return journey. It also brings home the differences in security, at Heathrow for example, it was jewellery off tablet separate, liquids on display, at Frankfurt Jewellery didn’t seem to set off the scanners, although something in my right shoulder apparently did, at EVERY scanner, making me think I may have a bionic shoulder I didn’t know about. Then we discover they’ve swapped the gate moving us from gate 19 to 36 (with what felt like the equivalent in miles to travel! ), we make it … just … and board. Take off, oh I should say at this point on all the flights there were complimentary sandwiches, a choice of Turkey or Cheese and drinks: lager, wine, soft drinks, coffee etc. So, with the punctuality, service and choice, all in all I would definitely fly with this airline again. 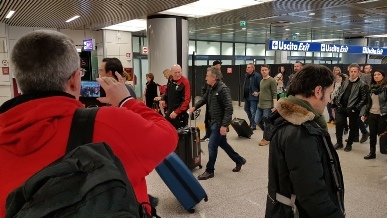 We land in Flumicino airport, clear security and make our way to look for our lift into Rome, and again are met with signs for ‘Robert Davies’ … but not ‘our’ Robert Davies, come on how many Robert Davies are there in Rome? Okay, okay I know probably quite a few more this particular weekend no doubt. 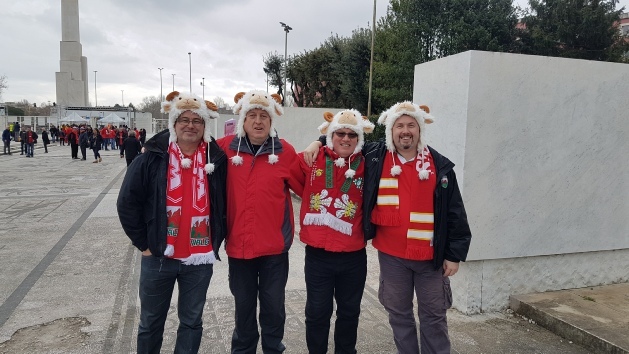 Still we find our contact and whilst taking a seat waiting for our car to arrive are passed by another few guys from Wales over for the match … and tell you what I’m sure I’ve seen them before somewhere. 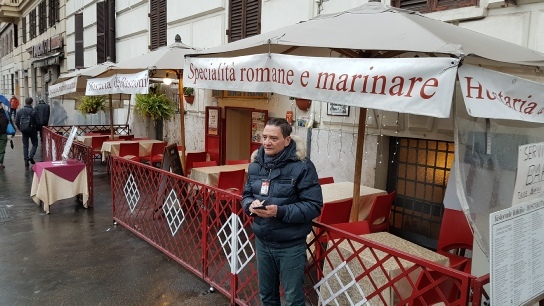 Our driver turns up, and we head into Rome in what is (from my limited experience) THE WORST place on earth to drive … I have never seen drivers like it. I mean for our next trip I’m taking tranquillisers with me, it will at least mean I won’t have to do over half the journey with my eyes closed! A method that looking back it appeared half the other drivers were following! 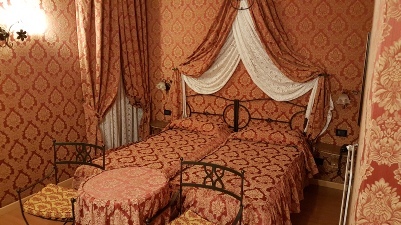 We arrive at our ‘Rome away from Home’ … sorry couldn’t resist that one! 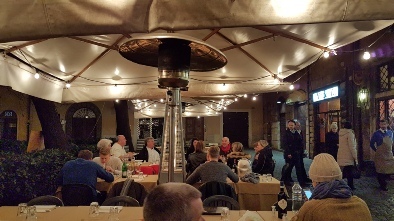 A quick freshen up and we venture out, and find ourselves at the same restaurant as last time, Ristorante La Piazzetta Del Quirinale However even though it is unseasonally warm, it begin to rain so we decide to eat inside. 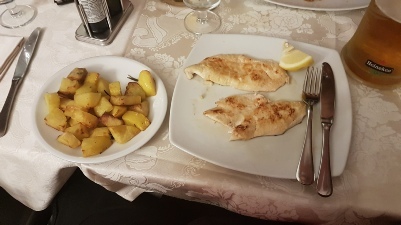 The meal is great, I had the chicken and we each had a ‘small’ lager. 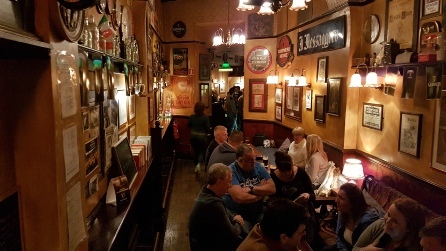 We then find our way, almost like homing pigeons to the location of the ‘ex-pat’ in Rome, The Albert. 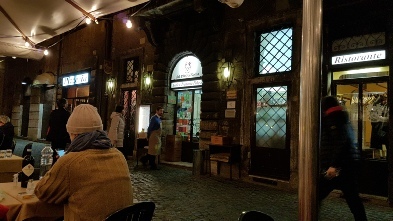 A relatively small bar around the corner from our hotel. 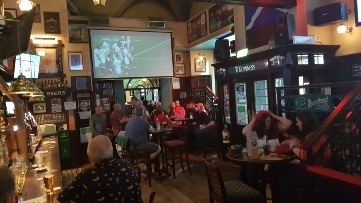 We partake of a few pints, enjoy the entertainment as one very ‘happy’ Welsh lady sings for the whole establishment, and it appears a few drinks. Oh and may have been stood (in our position outside the main door) in a live action re-enactment of an episode of “the Bill”, as there was definitely something going on, with at least 6 random people coming out of said pub, getting in a car parked there driving round the corner, and not coming back! Even though the car did!! Oh it as also here we met the only man IN – THE – WORLD who could have his ‘first child’ born… twice! As said gent of African descent came up to us ‘giving’ us trinkets he sold normally as his “first baby had been born” that very day … only to then ask us what we would like to give him to celebrate his status as a new father. Strangely when my brother returned from the bar he recognised said gent as being the one who ‘gave’ him said gifts upon the arrival of his ‘first born’ two years earlier in a location just three streets away! Returning to our Hotel at nearly 11pm … and sleep. 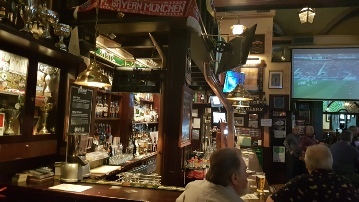 Then at about 10:50am we adjourn to the Scholars Lounge, an Irish Bar in the centre of Rome, with, I think, I didn’t count them, about 22 TV screens of various dimensions. Here we have a few pints and a meal, very nice it was too. Now in the spirit of full disclosure I should say here that although my esteemed colleagues did, I personally did not stick the pace, I mean it was about 4 hours plus till the first match, then there were two of them, neither of which we had any part in, so I bailed just before the first one and returned towards the end of the second. My back was playing up a bit, but, and I fully expect to get pilloried for this next comment, I’m not really a massive Rugby fan (Runs and ducks for cover) I love watching Wales play in the stadium or in a pub full of like minded Taffs, but for me these trips are always more about the fun, the friends, the trip … the Craic! Other memories of this time just came to me: firstly a warning, the door to the toilets is one of those ‘Western Bar’ doors you know the ¾ swing types, which I have discovered no matter how cool they look in the movies, result in, at least for me, either jamming my fingers or slamming myself in the left t*t on entry. much to the embarrassment of said member of bar staff. Secondly I find my colleagues still vertical! Good on ‘ya boys!! I squeeze myself to the table, and they finish their drinks and we pop out of the door, well pop is the right word as this particular pub appears to have elastic walls at this point, it was RAMMED. 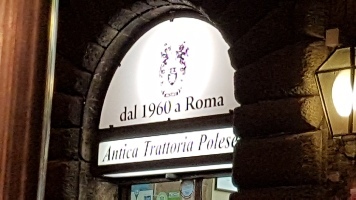 We decide to find another of our favourite places Ristoante Polese where we had the usual friendly welcome and great meal. We wander back enjoying the atmosphere and head to bed as tomorrow is MATCH DAY! Match day and again when we wake up and venture out it’s dry. 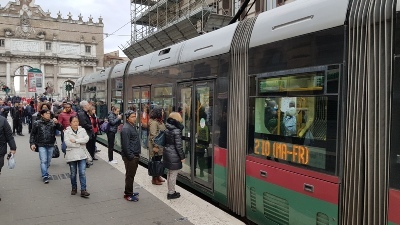 So we wander a bit and head to a small cafe that we’ve visited in previous trips, it’s small (no interior seating area and about 6 tables outside) serving Pizza and beer, but is right next to the tram line, which is our decided method of transport this year. We had considered Uber however luckily I spotted a tiny ‘I’ next to the price, as in London I was quoted a price and that was it, however this little letter informed me the price quoted (here in Rome) was the minimum we would pay, and the price would go up depending on distance, time and possibly other factors, not a transparent deal I must say. 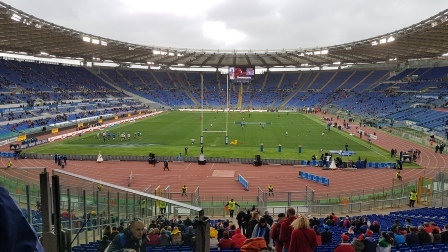 So for 7.50 euro (FOR THE 5 OF US) we get on a tram and are taken on a 10 minute ride to within 10 minute walk of the Stadio Olympico. We disembark and head straight to another little restaurant and have a beer. One thing that was driven home by this venue was that Italy definitely does not have the same toiletry requirements (statutory I mean not biologically) of the UK I mean for both of the last venues there is one toilet, and that isn’t one each (male/female) I mean one single cubicle for everyone, now with the amount of Welsh (and Italian) fans partaking of a few (and a few more) pints this results in quite … substantial queues. 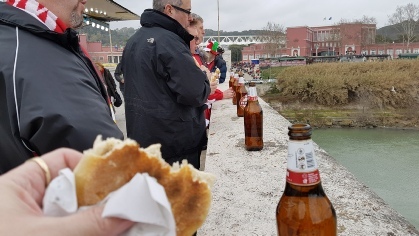 We move on after one round towards the ground, passing vans selling food (so we have a Pork Roll) and buy a bottle of lager from a guy selling them on the street. Soon realising that he isn’t gonna be giving Lord Sugar any sleepless nights for entrepreneurship as he was selling the lager but didn’t have a bottle opener to OPEN said refreshment. 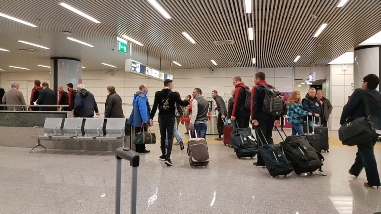 Upon reaching the ground we were faced with the age old dilemma of those brave souls on this type of trip: ¾ full bottles of beer that we can’t take into the ground versus 4/5 full bladders that needed emptying, only suitable location for said activity being beyond the security gates …. 5 bottles in the bin and we walk (from the knees down) into the ground. 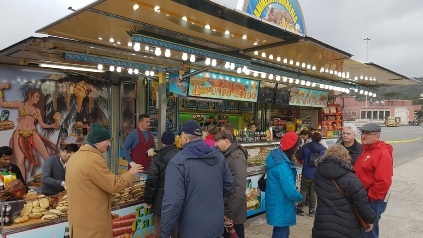 Now Peroni village as it is colloquially known is an outer ring of beer and food stalls with entertainment (both professional and supplied by the fans) around the stadium proper, and we spent some time there. 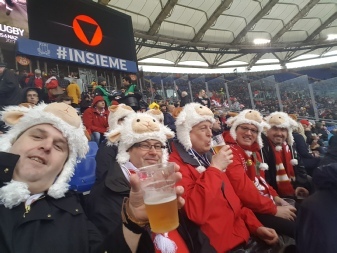 Our headgear making us the entertainment for a large percentage of the Italian fans, for a little while I knew what it must be like to be famous with the amount of requests for selfies! Resulting in us both cracking up uncontrollably. Then it started to rain, luckily I had my trusty ‘drovers’ coat and John had his trusty bin liner! Well whatever floats your boat I suppose. The rain didn’t last too long luckily and the match started, we had a poor first half but really came to life in the second resulting in a final score of 33-7 to Wales. We decide to let a percentage of the fans leave, to give us a better chance of getting on the tram, so we hang around in the village a little longer, ‘starring in more selfies, having a few more beers, my brother beating (verbally) the staff at the Peroni tent into selling him (and I) their baseball caps, a design not available in the shops, he then wanders round and manages to get either free (or a discounted price on) plastic hands (don’t ask) scarves, baseball caps a bag and a shirt. At some point around this time my injury was exacerbated, what injury I hear you ask? Well I didn’t want to mention it as I was being a brave little soldier. You could say it was an equipment caused injury … although not a “where there’s blame there’s a claim” type, as it was sort of self inflicted … what exactly happened? Well I was attempting to dry my hair earlier that morning, with a hairdryer in the hotel room en-suite that frankly I could have expelled more warm air than by blowing at the mirror so ‘throwing’ my head side to side to introduce more of said mane to said air expeller I managed to pull a muscle in my neck. How was said injury compounded, well one of our number (no name no pack drill Mr Davies Travel) grabbed round my shoulder so we all looked like we were in a scrum but as I am a little less (how can I put this politely) vertically challenged said pressure added to the pain in my neck caused me to lean back a little further than I intended resulting in a quick cry of ‘Tiiiiiiiiimmmmmbbbbbeeeerrrr’ as I crashed to the ground in an unceremonious pile! This being our last full day in Rome was our day for visiting the Vatican. 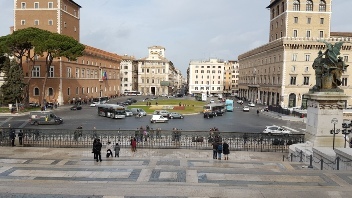 We had been to St. Peter’s Square on previous visits, but had been put off entering due to the always long queues, usually up to twice around said square. 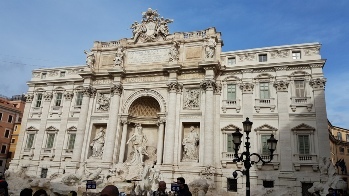 So this time Rob Davies Travel had pre-booked us on a set time guided tour with ‘Enjoy Rome’. 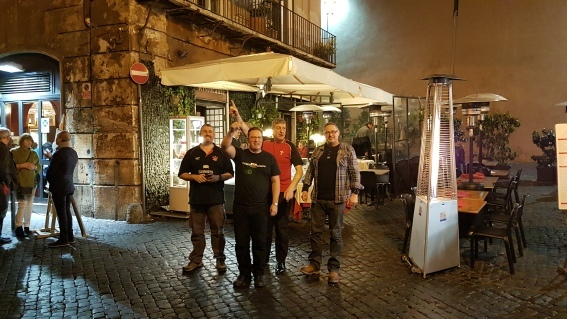 So we wandered in the rain towards the Vatican passing by chance another great pub The Abbey Theatre Irish bar, before they were due to open. 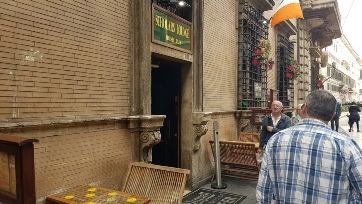 However, as during our last visit, seeing 5 thirsty looking Welshmen outside they opened early for us so it was coffees all round except for me (I never drink anything hot, a little foible of mine) so I had a coke, why no lager I hear you ask? Well re-read this review from the beginning then think before asking me that! We carry on our journey, get to, and pass St. Peter’s square looking for the ‘Love Rome’ offices. Eventually finding them, only after realising that the queues we saw previously were only the half of it with ones almost as long at this ‘other’ side of the Vatican too. We find the office and realising we’re a little early decide on a meal and come across, about 3 doors away, this nice little restaurant and had a light lunch there before joining our tour. Where we are issued with radio receivers and single earphones, a clever idea as thinking about it with the amount of organised tours there and the general public the guide trying to make themselves heard would have been almost impossible. 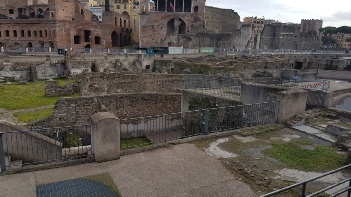 We follow the very helpful, knowledgeable and friendly guide into the Vatican Museum bypassing all the queues, and spend the next 3 hours viewing all this location had to offer. Here’s a link to a photo gallery for you to see some of the photos I took. 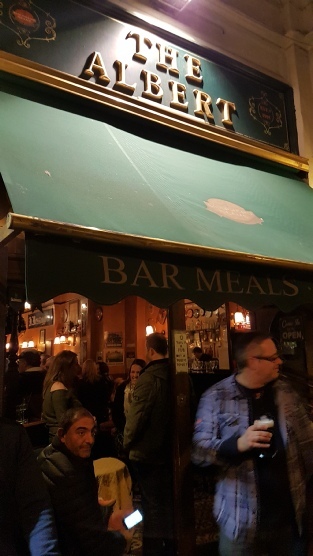 After this tour I was totally knackered, and my brother was in pain from his knee, so we decided to head back to the Abbey Theatre bar, have a quick meal and a few pints and call it a night, as ‘tomorrow we travel’. 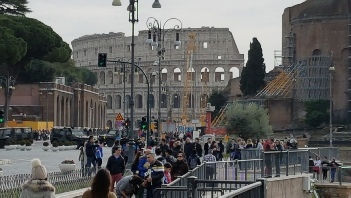 We are collected the following morning by the same maniac … sorry driver who brought us from the airport, we re-join Deathrace 2000 (otherwise known as Rome Rush Hour) and get to the airport. Check in is not quite as straight forward as one would have hoped as it involved a game of pass the parcel with said parcel being a mobile phone with a range of electronic boarding passes displayed on it. This being after we are ‘helpfully’ informed that although you can print (which Rob Davies Travel kindly did for us to aid our journey through the various travel hubs) boarding passes the scanners only read the electronic versions! now when you consider for one of our number an ‘ap’ is part of a small opening … think about it .. This could have been a challenge but we rose to the occasion. 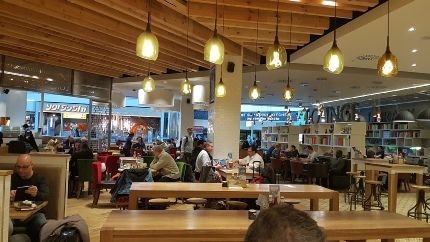 We wait for our first flight, Rome to Munich, and once there for about an hour for our final flight, with only one moment of note. My discovery that Germany has it’s equivalent of Arkwright’s Till … I went to the gents and was pleased to discover not only had they eschewed the other airports fascination with the toilets that turn grown men into live action ‘whack-a-mole’ games, with those auto flush sensors that fire for no good reason. But indeed have the ‘old’ pull down roll of towel to dry your hands, fine as I pull down a section, start to dry my digits only for said towel to snap back into the dispenser damn near taking my fingers with it! 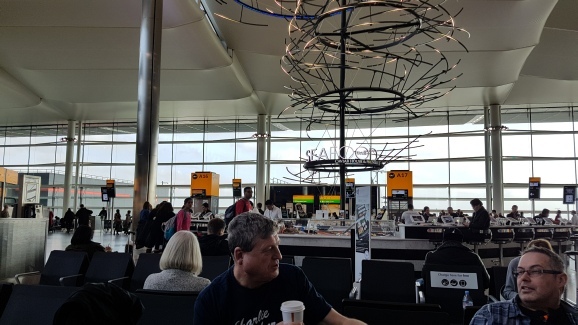 Onwards to London Heathrow, and as I mentioned earlier these journeys had been great and I would recommend and use again Lufthansa in a heartbeat. However there always had to be a problem somewhere and who would have thought with all these different providers of varying methods of transport it would have been a Welsh problem. We get through customs, well all of us except (strangely enough) Rob Davies Travel who’s chip didn’t work …. it’s an overuse thing we all agree, as a day trip Guernsey and he would have to apply for ‘Non-Dom’ status! Now as the representative of National Express on the site at the time if NOT his then who??? Luckily when he enquired from one of the Heathrow staff who helpfully checked on the radio and advised him that it was a National Express error (they hadn’t printed the list fully) we were allowed on. Only after being pointed to where we needed to load our own bags into the storage of the bus, resulting in me being of a larger disposition smacking his head on door of said storage area. 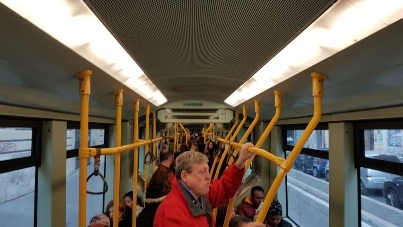 So we get on what we quickly realise is a much fuller and UNBELIEVEABLY hot bus for the uncomfortable journey home. Oh and why do I say this is a Welsh problem when National Express is a ‘National’ organisation, well put it this way when the bus pulled in my heart sank as it was pointed out the bus was supplied by Edwards Coaches the Welsh firm of the horrendous return journey from Ireland a few years back, check out my review for full details.